- She acquired the basics of Vocal Music from Sri Muthu Natesa Bagavathar at a very young age. He is her first guru. 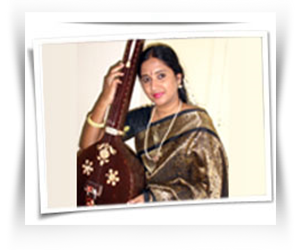 She acquired the nuances of Classical Carnatic Music from him. - Later on she learnt from Sri P.S.Thiagarajan. - The advent of “Guru” at a very early age is impressed by HH Haridoss Giri (Guruji). HH put her in to the able tutelage of Sangeetha Kalanidhi Dr.M.L.Vasanthakumari. - She was also trained by another doyen of Carnatic Music Smt.Sulochana Pattabhiraman for some time. - HH Giri (Guruji) as an ever guiding guru placed her under the tutelage of the great master Sri.P.S.Narayanaswamy.